I'd like to make my darling SIL a Tumbling Blocks quilt for Christmas. I saw a video on this ages ago where two strips were joined and cut at an angle and joined. I plan to use three shades of blue to get the effect. However, I've been searching for a simple pattern and have come across ones that speak about 'setting in' and Y-blocks?? What is that and will I need to do it? I need a pattern that tells me how much fabric I'll need in each colour and the finished size - around a throw size would be great. (I'm not very experienced but can follow a pattern - just, lol). Can anyone please point me in the direction of a simple pattern? (Happy to buy this). Also, is there anything else I should know before I start? Here are some links to tumbling blocks without Y seams. I think but am not sure, that Nancy Zieman did this and you can watch her shows for free on www.nancyzieman.com. As Scissor Queen has said, the one without the y seam is so much easier to make. I will never use the pattern with the y seam again. Good luck with your's. There is a book by Marci baker that is excellent. All strip pieced without y seams. Her video sample is on the Internet but I recommend the book. I used this link http://www.myquiltfabric.com/pdf/Tumbling_Blocks.pdf to make mine with no y seams. I only had trouble with one section and I found if I flipped my second strips over to cut, they were at the correct angle. 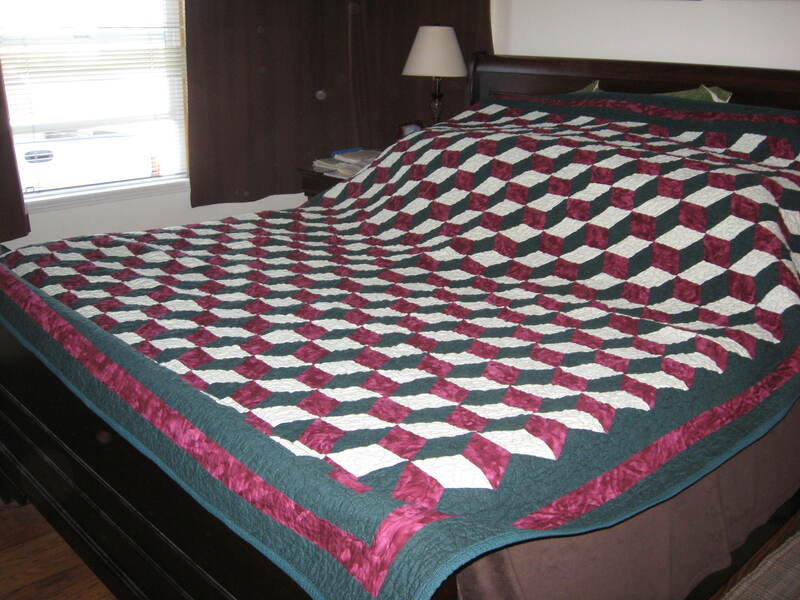 I found the link here on the Quilting Board too under links and resources. 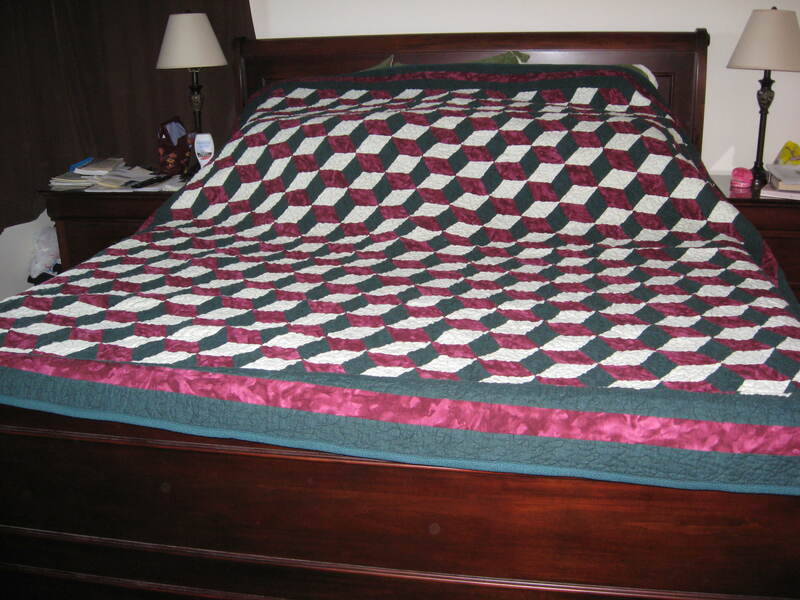 Here are pics of my finished quilt. Your quilt is lovely! Exactly the kind I have in mind. Thanks for all the replies folks - I'm off to do some clicking now! Even with the Y seams, tumbling blocks can be a lot of fun to make, but the no-Yseam tumbling blocks are a much better idea for your first one. but to master the Y-seam is so impressive!!!! It's not difficult, you have to remember to stop 1/4" from the edge (then I back stitch to anchor the seam). I have a question regarding tumbling blocks made with strip-piecing and no Y seams. I also saw a grandmother's garden quilt made up of lots of hexagons that also use the strip piecing method with no Y seams. However, it looks like both of these end up with vertical seams going right down the middle where you join the strips. And then your tumbling blocks with have an additional seam going down them. I used my Go to die cut 60 degree diamonds and didn't have a problem sewing the Y seams. I just left 1/4" inch unsewn on each block and added another one. I found it much faster to sew using the Y seams. I took a Marci Baker workshop and it was fun to see the strips coming together to make this quilt. i took the Craftsy.com free BOM for 2013 and on it the instructor showed how to do this block.